Today, Crown Princess Victoria held a board meeting at the Royal Palace in Stockholm for a foundation which shares her name. 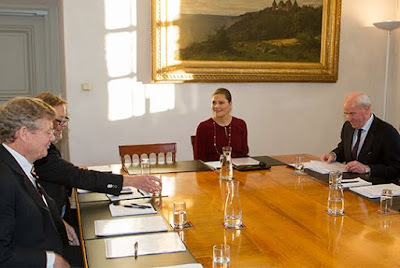 The Crown Princess Victoria Foundation for Scientific Research promotes scientific research and provides support for education and training in this field. You can check out more about the foundation by checking out their website HERE. Victoria re-wore her Seraphine Bordeaux Woven Crepe Dress in a dark red once again. This dress is still in stock so if you love it, go grab it now! 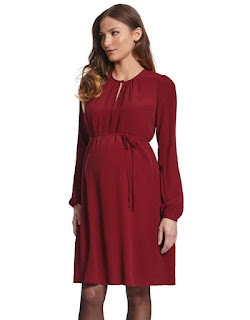 It would make a fantastic Christmas dress whether you are pregnant or not!! She appears to be wearing a long necklace which most likely comes from Kreuger Jewellery- but the distance and quality of the photo makes it impossible to be able to say for sure. Photo from Kungahuset and Seraphine. We can't see the bump :( And yes prepare for all of my comments over the next 3 1/2 months to be bump based. I do really like that color on her!